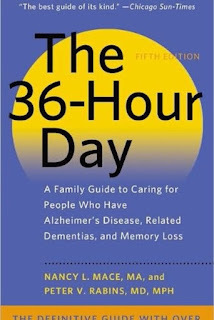 The 36-Hour Day is an essential resource for families who love and care for people with Alzheimer disease, related dementia, or memory care issues. This best-selling book is the bible for families caring for people with Alzheimer's. The book is ranked the number one best seller in three categories on Amazon: Alzheimer's disease, Caregiving, and Eldercare. It carries a five star review from customers. and how to help each other as we take on the many different roles needed to provide care for her. I highly recommend this book to others; in fact, I have purchased multiple copies to share with family members and donate to my local library - that's how helpful and important this book is! I wish I had bought this book as soon as my mother was diagnosed with Alzheimer's disease. My father has received very little information from my mother's doctors on what to expect as her disease progresses and more importantly, how to deal with these issues. When I received the book, I looked up her latest problem in the index, dizziness, and turned right to an informative section that helped clarify what's going on with my mom. The bathing sections are helpful for understanding and thus coping with those issues. I appreciate the depth of topics and detail for symptoms that Alzheimer's patients can have; I am also grateful for the huge emphasis on respite care for the caregiver. This gives my siblings and me another avenue of discussion in getting help for my dad, who like many spouses has his own health issues. I wish my family and I had received this book when my mother was first diagnosed with dementia 2 years ago. We wandered along this path with little guidance from her g.p. or even from the (truly excellent) neurologist at the highly reputable medical school. I have read answers to questions which have been nagging at me for months (probably years now). The resources at the back are also helpful for the non-social-worker-non-medical-person which I am and which most family members of dementia patients are. This should be called, "What To Expect When a Family Member Has Dementia or Alzheimer's". It is truly a must read for anyone who has a family member with this tragic, difficult illness.